5pm in Three Brothers Chapel. Rev. MaryAnne Korsch will do a brief remembrance of the Last Supper and offer Holy Communion for any church members, Ruby’s Pantry patrons or volunteers who would like to take part. Come any time during that hour. Full Maundy Thursday service at Hillside UMC – 6:30pm, 1801 Piedmont Ave. This is for FUMC and Hillside UMC congregations. Pastors Jeanine and Cynthia will lead this service together. Members of our choir will join with members of the Hillside choir to provide music. You have the opportunity to participate in the annual Holy Week prayer vigil. Sign up for one hour of prayer at church or at home beginning at 8pm after the Maundy Thursday Service (April 18) until the Good Friday Service (April 19). There will be prayer guides and prayer petitions available and a system for unlocking the door throughout the night. Praying can be singing, reading the Bible, meditating, doing yoga, or however you want to spend your time communicating with God. Bring your Bible and enjoy this peaceful, meaningful time with God. For prayer requests for this vigil, use the box in the Narthex with purple paper. Write the person’s first name and prayer request on a piece of purple paper, fold and place it in the box provided. Prayers may be added during the vigil time as well. Direct questions to Cindy Hedland or Mike Goodlet. 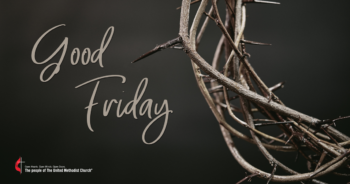 Good Friday service – Noon, in the Three Brothers Chapel. Music, meditation, and walking with Jesus to the cross. Tenebrae Service – 7:00pm (walking through the last days of Jesus’ life, the service of the shadows) This is a powerful service which includes the Sanctuary Choir and Strikepoint. Join us in the parking lot for a 20-minute sunrise service as we watch the sun come up over Lake Superior. Children’s Activities begin at 10:15am. Join us for the Easter Egg Scramble and other activites taking place on the lower level. See Family News on page 3 for more details.